From sea, sky, and land, they’ve come! 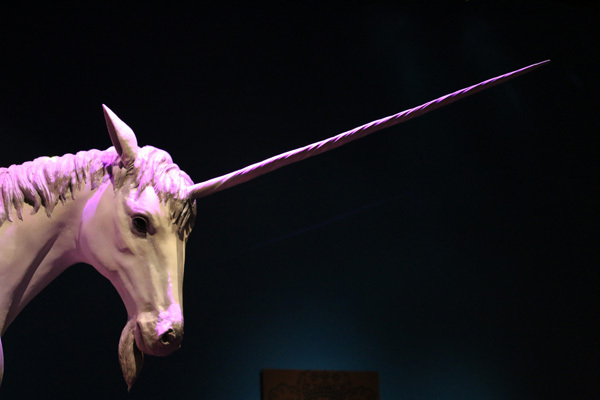 Mythic Creatures have invaded the Denver Museum of Nature and Science. From now until September 7th, your family can encounter some of the most legendary beasts concocted by the human imagination. Some are really scary. (Chupacabra, I’m looking at you.) Some are majestic, like the Unicorn or Griffon. Others are comical, colorful, creepy or all of the above. The newest exhibit at the DMNS brings together history, geography, oral tradition, mythology, and the fossil record in one of the most innovative collections I’ve ever seen. Massive life-sized creatures rise from the floor, swoop from the rafters, and pose as if they are about to kick off the best fantasy epic this side of Lord of the Rings. Mythic Creatures: Dragons, Unicorns, and Mermaids shows that science and the fanciful can coexist beautifully. Each creature is explained with wonderful clarity, using art, fossils, literature, and even today’s pop culture to complete a picture of a world that has faded away. It’s easy for our 21st century mindset to dismiss our ancestors as wide-eyed children who believed in elephant-sized birds and fire-breathing dragons, but this exhibit doesn’t insult or disrespect those cultural differences. 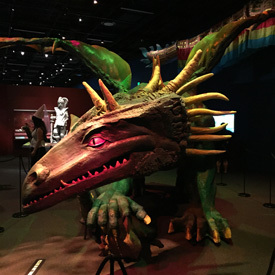 Along with the huge models of the most famous mythic creatures, the exhibit offers families opportunities to create their own mythic creatures. A large art station invites kids of all ages to create their own Mythic Creature to hang up on a wall for all to admire. Little ones can play with whimsical puppets. You can design your own dragon on a touch screen and release it to fly. Story tellers share exciting legends. We stopped at a booth dedicated to Colorado’s own mythic creatures. Have you seen a jackalope? A furry trout? Bigfoot? All live in our great state. Maybe. Probably not. But it’s fun to think about. When you visit Mythic Creatures: Dragons, Unicorns, and Mermaids, there are a few things to keep in mind. ~ Younger kids could be scared by some of the larger, more detailed creatures. My older kids thought they were fantastic and beautiful, but my toddler flipped out when he saw the chupacabra. It’s small, but he noticed. ~ Strollers and photography are allowed (no flash, though!). ~ Admission into the exhibit is included in the price of museum admission. ~ Make sure you get a green screen photo on your way out. Hilarious! ~ The exhibit is a great size for families. It’s long enough to leave you feeling like you learned a lot, but short enough to accommodate the attention spans of kids. 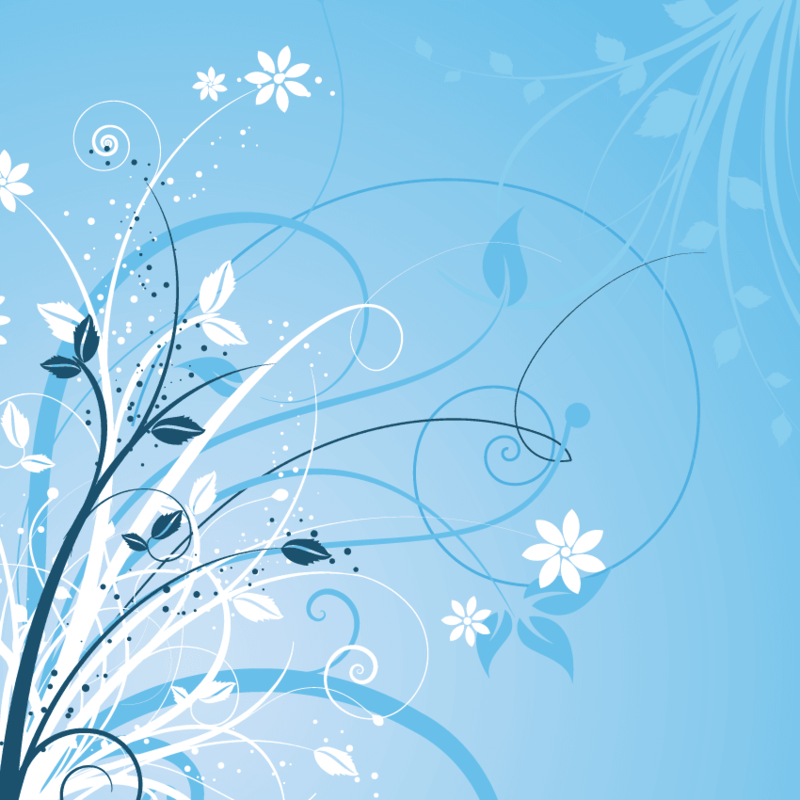 ~ It is open every day until September 7th. We had a great time checking it out! My kids were hoping for a few more interactive components of this but had a blast drawing (or in my case, tracing) their own mythical creatures, listening to the storytelling and the green screen at the end.